The Q4 will take design cues from the TT offroad concept, pictured. INGOLSTADT, Germany -- Audi confirmed it will launch its Q4 in 2019 as the brand continues to expand in the hot-selling SUV/crossover market. The coupe-styled SUV/crossover will challenge models such as the upcoming BMW X2 and the Range Rover Evoque. 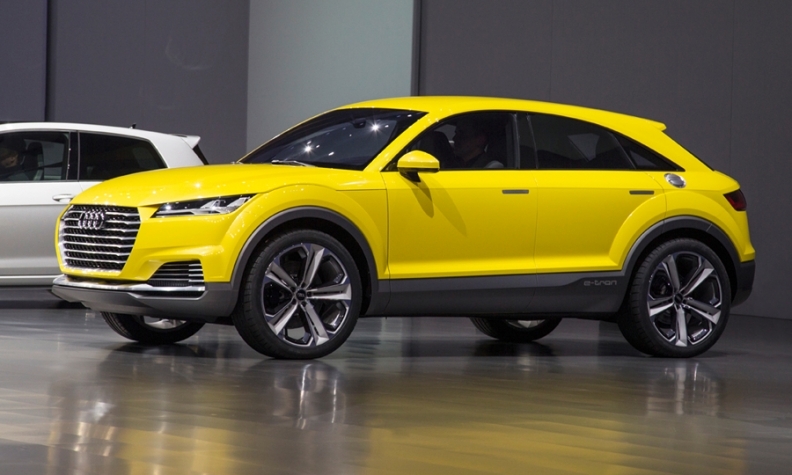 "We offered a preview of this type of vehicle with the Audi TT offroad concept study three years ago," Audi CEO Rupert Stadler told reporters on Wednesday here during the automaker's annual earnings news conference. The Q4 will be a niche model positioned between the Q3 and Q5 volume SUVs, whose volumes last year amounted to 232,045 and 278,968 vehicles, respectively. It will take many design cues from the TT Offroad concept unveiled at the 2014 Beijing auto show. The concept combined the sportiness of a coupe with the lifestyle appeal and utility of an SUV. Audi said it will "significantly rejuvenate" its model portfolio in the coming years with all-new models such as the Q4 and the Q8, the brand's flagship SUV, which will go on sale in 2018. New generations of its A8 flagship and A5 midsize sedans will go on sale this year and the second-generation A7 arrives next year.